A changing of the guard is under way with the Canadian men's soccer team with Scott Arfield taking over as permanent captain from Atiba Hutchinson. Health permitting, Arfield will lead out the 79th-ranked Canadians against No. 177 Dominica in CONCACAF Nation League qualifying play Tuesday at BMO Field. The Glasgow Rangers midfielder also wore the captain's armband for last month's 8-0 win over the U.S. Virgin Islands. 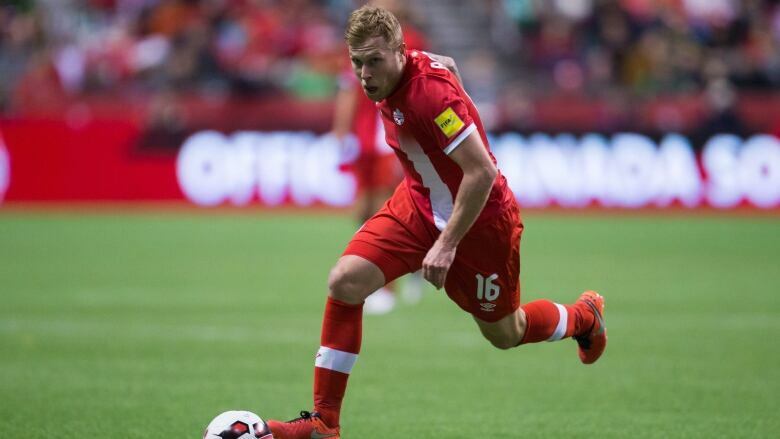 Arfield, who left practice early Sunday as a precautionary move with a minor knock, has won 13 caps for Canada since making his debut in March 2016. The 35-year-old Hutchinson, arguably Canada's best soccer export, remains a key figure in the Canada camp. With 78 caps and both Champions and Europa League play under his belt with Turkey's Besiktas, Hutchinson has seen it all. But he is in the twilight of his career, saying he may call time on the international game after the 2019 Gold Cup. Coach John Herdman gave the 29-year-old Arfield the armband but only after speaking to Hutchinson, whose last participation with the national team was in September 2017. "Look he has just a great presence," Herdman said of Hutchinson. "The conversations we had pre-camp around leadership and captaincy, what he knows is that he can support someone like Scott who might have a longer future in the game. And he's ready to hand that baton over and be a mentor, a sounding board for Scott. "They balance each other off really well. Scott brings a super-outgoing positive energy and he's vocal. Whereas Atiba is reflective, quiet, unassuming, but he's dialled into everything. He's dialled into the spirit of the group, he's dialled into the psyche of the players. You can just sense he has a great feel for people and the environment. I think we've got a great balance." Veteran Los Angeles FC defender Dejan Jakovic served as captain for Herdman's first game at the men's helm, a 1-0 friendly win over New Zealand in March in Murcia, Spain. Hutchinson was 19 when he made his senior debut for Canada in January 2003 under Holger Osieck. Herdman represents his 10th national team coach, following Osieck, Colin Miller, Frank Yallop, Stephen Hart, Dale Mitchell, Tony Fonseca, Benito Floro, Michael Findlay and Octavio Zambrano. "There's been a few of them," Hutchinson said. He says Herdman communicates a clear vision. "He works on all the little details. I think that's good for us — not only be working on certain things but we're covering everything, every aspect. I think that's something that we need here. Obviously that together with the talent that we have now, with the young players, the combination looks very good, it looks very promising." Herdman has structured the team so every player has a voice, with veterans, youngsters and those in-between each meeting separately as groups to talk about their goals and experiences. Toronto FC midfielder Jonathan Osorio pointed to defender David Edgar (a 31-year-old with 42 caps) and Junior Hoilett (who plays for Cardiff City in the English Premier League) as others in the senior leadership group. The 23-year-old Samuel Piette (49 caps) and the 26-year-old Osorio (21 caps) are part of the in-between group. "Within these groups we always get together and then combine at the end," Osorio said. "I think it's a good thing that the coach has going for us. It's a way for all of us to connect." "The chemistry between everybody, it just improves every time," he added. The Scottish-born Arfield, a native of Livingston, qualifies to play for Canada through his Toronto-born father. Arfield's grandfather was in the military and was briefly stationed in Canada. Arfield won 17 caps for the Scotland under-21 team and one for Scotland B. But he never got an invite from the senior side. Hutchinson, who is coming back from surgery to remove some loose bone in his ankle, is now the eminence grise of the Canada team. "He's the greatest ever," said Osorio. "This is a guy that all of us look up to ... He's one to lead more by example but his voice is always listened to by all of us. I don't think there's too much argument that he's the greatest Canadian (player)." He is also good for business. Hutchinson, a native of nearby Brampton, expects to have 80-plus family and friends at Tuesday's game. The teenagers in Herdman's 23-man squad for Dominica are Alphonso Davies (age 17), Alessandro Busti and Jonathan David (both 18) and Ballou Tabla, Zachary Brault-Guillard and Liam Millar (all 19). It's a first time call-up for Tabla, the former Montreal Impact midfielder now with the FC Barcelona B team. Busti, who plays for the Juventus reserves in Italy, could also earn his first cap Tuesday. Dominica is coming off a 0-0 tie with No. 153 Suriname. Tuesday's game is one of four for Canada in qualifying play for the CONCACAF Nations League, setting the stage for a three-tier competition — complete with promotion and relegation — that kicks off in the fall of 2019 in the confederation covering North and Central America and the Caribbean.